I hope to provide you with an educated answer as to why you should choose to install a fiberglass pool over say a vinyl liner pool. This can be a tough choice for some but I believe I can sway your decision by the time you finish reading this article. 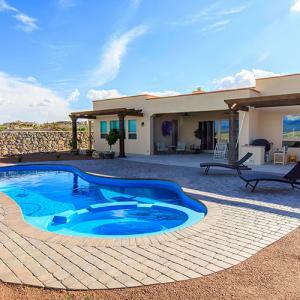 When talking with your prospective pool builder, ask him or her how much money you will have to invest in preventive maintenance over the years you will own and operate your new pool. Fiberglass pools make a great option if you are looking for a pool that will last without having to fork over large sums of money down the road. 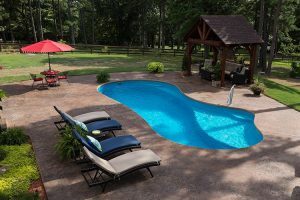 Fiberglass Pools will require little maintenance compared to other types of in-ground pools and fiberglass pools will be aesthetically pleasing to the eye. The surface of a fiberglass pool is non-porous, which means the surface will resist algae growth and drastically reduce the amount of money spent on chemicals to treat your pool. The smooth glossy surface will also reduce time spent cleaning your pool. Clearly, fiberglass pools should be your first choice if you want to spend less on maintenance & chemicals over any other type of swimming pool. You will also save thousands on maintenance costs over the lifetime of a fiberglass pool vs any other type of swimming pool. Vinyl liner pools are commonly less expensive to install than fiberglass pools, but… A vinyl liner pool will cost you more over its lifetime to treat and maintain. Eventually you will have to replace the vinyl liner in your pool. Vinyl liners last between 7 to 10 years before needing to be replaced. Vinyl liners do come with a warranty, but those warranties pro-rate over time and only cover manufacturing defects such as a seam separations. The warranty does not cover general wear and tear. Chemical balance issues can also cause a pool liner to fail prematurely and is not covered under the liner warranty. It is important to maintain proper water balance in any pool. A pool liner replacement typically costs between $4000 and $7000 depending on the size of the pool and the severity of the repairs being made during the process. If you have known for several years the pool had a leak only to learn after removing the old liner that the steel or aluminum pool wall is completely rusted or corroded through you may be looking at additional repair costs before a new liner can be installed. A liner replacement is never just a liner replacement. Whoever you choose to install your new pool liner, be sure you are on site when the old liner is removed. Make sure any rust or corrosion is addressed before your new pool liner is installed. You also have to be more careful with a vinyl liner pool than with any other type of surface. Vinyl liners are only 20 to 27 mils thick and can be punctured easily with a broken pool pole, rough bristles on a pool brush or vacuum head. Even sharp toe nails have been known to make a cut in a liner. Vinyl liners are not nearly as durable as a fiberglass pool. Concrete Pools might be your worst choice. Concrete pools must be stripped and painted more often than vinyl liners need to be replaced. 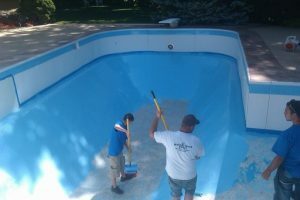 This process can take weeks depending on weather and can cost in upwards of $6500 to have your pool painted. Not a wise decision for your pocket book. I have painted many pools in my time. This is not a fun job. I would choose Fiberglass Pools over any other type of swimming pool. When choosing which pool to install, please consider not only the price, but also what the pool will cost to treat and maintain year after year. I hope this article has helped inform you of the benefits of owning a fiberglass over a vinyl liner or concrete pool. It is our hope that you and your family enjoy your new vacation at home for years to come whatever pool you decide to buy. Comment below and tell us about your experiences building your backyard oasis.